Summer is here! YAY (except boo for the southern humidity)! Christine is our hostess this month. She has chosen the theme of Masculine Christmas cards. That's a good thing for me because I do lack in manly Christmas cards in my stash. I wanted to do something a little non-traditional for this challenge. I have had the soda stamp and die set from My Favorite Things for a long time and not used it yet. I also had a piece of alcohol inked background on foil paper from Tim Holtz that just seemed perfect. So I cut the bottle from the AI foil cardstock, cut the scarf, antlers and bottle top from silver foil cardstock. Then I stamped the "peace" with versamark and embossed with silver emboss powder. It barely fit. For my background, I wanted to keep it simple because it is a CAS challenge and I wanted the soda bottle to stand out. So I used postage stamp dies from Simon Says and "embossed" instead of cutting them. Final touch was the sentiment from Papertrey Ink on a banner die inked in Fiesta Blue ink from Catherine Pooler Inks. 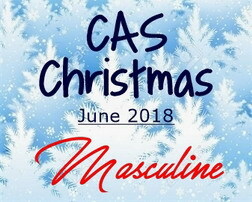 Stop by the CAS Christmas Blog and check out the rest of the Team's manly Christmas cards, so may different styles. Then get crafty, play along with us, and add some masculine Christmas cards to your stash. You have until June 24th to play along several times. Just remember to create a new project each time and make it CAS! 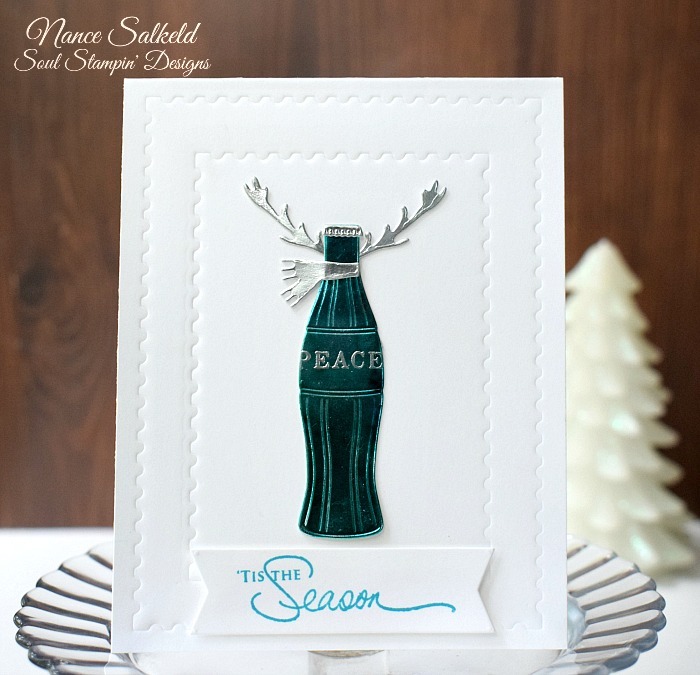 STAMPS: Peace sentiment (Hero Arts Layering Snowy Tree); Tis Season (PaperTrey Ink Signature Christmas Set). PAPER: White cardstock (Neenah 110 lb); Silver foil cardstock (Stampin' Up); Foil specialty paper for alcohol ink (Tim Holtz). INK: Fiesta Blue (Catherine Pooler Inks); Versamark; Patina, Cloudy Blue, Stream alcohol inks (Tim Holtz Ranger). EXTRAS: Soda bottle die (My Favorite Things); Antler and scarf dies (Flora & Fauna); Banner die (Reverse Confetti); Postage stamp dies (Simon Says). Totally awesome card, I love the non traditional look. the antlers and scarf make it such a fun card. Love, love, love the "Peace" bottle, my friend! What a clever masculine Christmas card! What a cool and creative design! Such a clever idea for a masculine Christmas card! 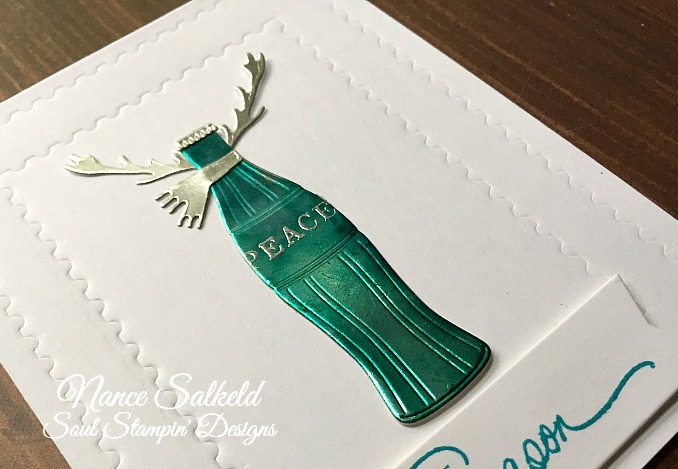 Lovely the green of the bottle and the great silver ribbon, antlers, and bottle cap. Great use of the postage stamp dies to emboss an interesting frame for the bottle. This is fabulous! You're so right about the AI foil card stock being perfect. You've managed to combine a feel of summer and winter, which is perfect for a Christmas card this time of year. Love how CAS and original this is!